( Yangon, 10th Aug 2018 ) – From 29th May to 1st June 2018, KBZ Bank Ltd, a leading bank of Myanmar hosted a team of 35 teachers from 15 Technology Universities at its Head Office with the intent of further development for the IT sector in Myanmar, an Information and Technology Update Refreshment Program as a field trip to Private Sectors. In order to mitigate the gap between the theoretical and practical fields of IT sector and to be efficient in teaching, the excursion team had a hands-on experience in which private sectors are using state of the art technologies. During the program, KBZ Bank arranged the workplace to favor the excursion teams, local and foreign professionals of KBZ Bank provided detailed panel discussions about the ever changing state of the art IT technologies and last but not the least relating Project Managers elaborated the implementation of high-tech enabled new products of KBZ Bank. With KBZ Bank’s facilitation, the excursion team had a field trip to KBZ Gateway at Bago Township to study about Satellite and Data Center operating procedures. 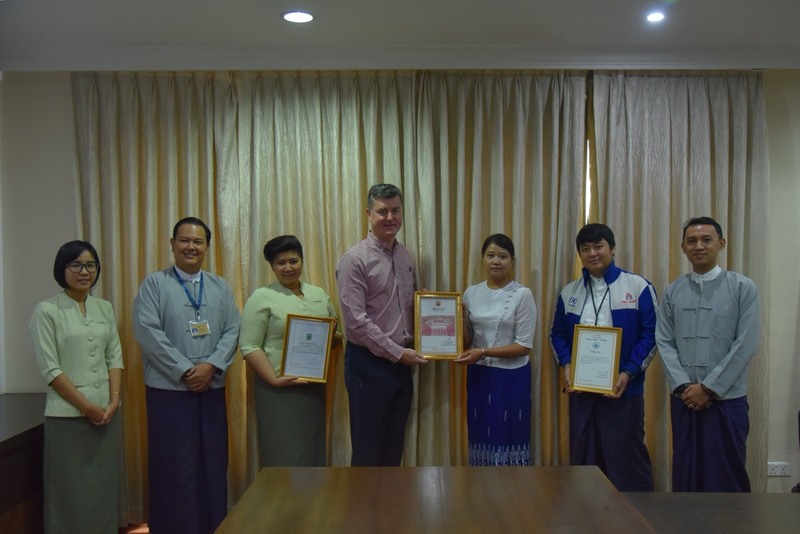 Moreover, KBZ Bank Ltd helped to refurbish 132 computers and donated among Meikhtilar, Mawlamyaing and Kyaukse Townships and is in under process to donate up to 8,000 computers to other needy universities for the development of IT sector in Myanmar. Through these refreshment courses, the teachers can combine theoretical and practical practices to hone their teaching skill in IT sector and IT Technology Students can be more innovative and their combining strengths will make Myanmar’s Future IT Sector to keep abreast with International Standards. And KBZ Bank Limited supported the 4th IT Technicians Panel Discussion and IT Camp organized by Yangon University of Computer Studies at ShwePyi Township as the Diamond Sponsor. The IT camp was attended by 3000 IT Technicians around Myanmar. The discussions included the strengths and weaknesses of working experiences, challenges from actual working environment and to continuous pursue learning in ever changing technology as presented by KBZ Bank’s officials who are UCSY’s alumni and Foreign and Local IT technicians. KBZ Bank, based on one of its core values Metta, has taken part to support Myanmar in its continuous development in every sector.